When we left snowy Belgium in March we first went to France and then to Canada. Yes, Canada. 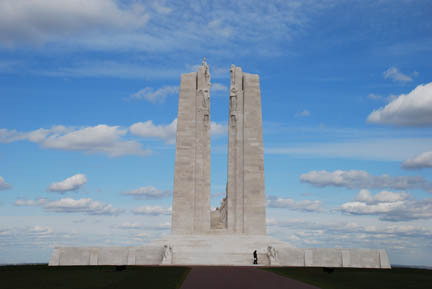 A WW I battle that was crucial to the Allies winning the war was fought by the Canadians on Vimy Ridge in northern France. 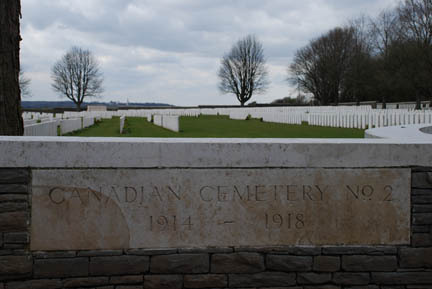 In gratitude the French government has given a section of the battlefield to Canada and you are in Canada, not France, when you visit it. The huge marble monument stands on the forefront of the ridge. It has the names of the over 11,000 soldiers who were never found engraved on it. The bodies they found are buried in nearby cemeteries. The small person on the steps is Kathy. 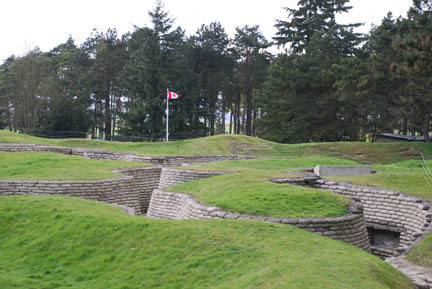 Nearby is a section of the battlefield that has been preserved with the trenches, gun emplacements and shell craters. Today grass and trees cover the area, the soldiers fought in mud and muck. These are the actual trenches, and on the right rear is a shell crater 100' (30 m.) wide and 40' (12m.) deep. I wouldn't have wanted to have been there when it landed. 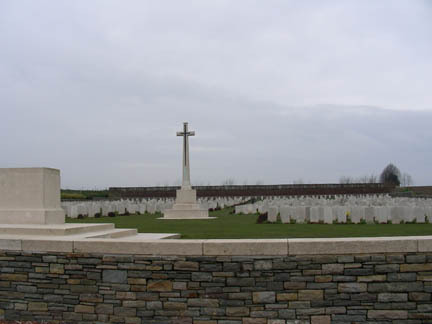 This is one of several cemeteries for the soldiers whose bodies were found. From here we're off to Normandy and more war. The "War to End All Wars" (WW I) wasn't. 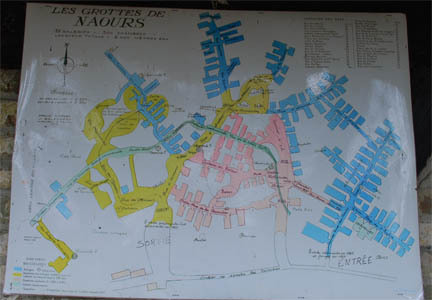 The first stop in Normandy was at a defensive place, Les Grottes de Naours. This is an underground city that was built in the chalk hills near Naours, France. It was started somewhere around the 4th or 5th century and expanded as the population grew over the years. The size is amazing, the blue hallway running up the right side is 300 meters long (330 yards). There were stables, churches, storage rooms, meeting rooms and living quarters for hundreds of people. The entrance was hidden and the smoke from the kitchens was routed up under shepherds houses and into their chimneys to disguise the origin. They locals survived the irregular battles of the Hundred Years War and the Thirty Years War by hiding out in here when the troops came near, sometimes for months. But it was not failsafe, the blue areas were the parts occupied by the Germans during WW II as a command and storage center. As we drove across Nord France we went past several cemeteries and town monuments. It seemed every small town in this area had been devastated by one or both of the two world wars. These neat orderly cemeteries are for foreign soldiers that died here. The French soldiers were usually returned to their hometown and buried in the local cemetery of their church. Next we visited the Hundred Years War in the 11th Century. 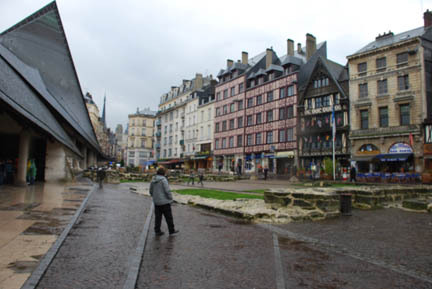 This one is famous for Joan of Arc, the 17 year old young lady that led the French to victories over the English but was captured and burned at the stake in this spot in Rouen, France. 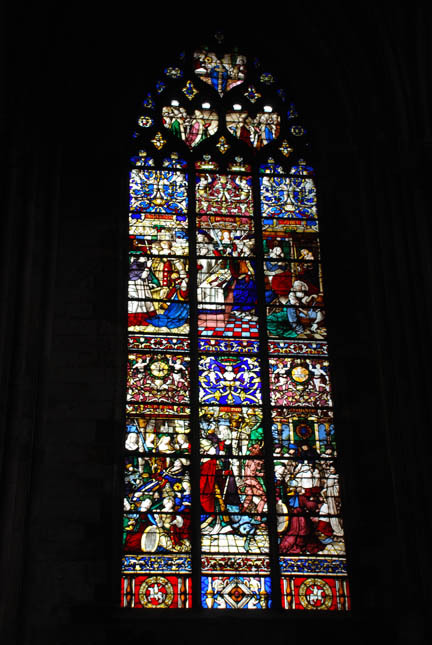 Rouen is also famous for its huge cathedral and its beautiful stained glass. When we were at the Belgium Treffen we met a French couple, Christiane and Thierry, and they asked us to stop by when we got to the city of Caen in Normandy. We are always a bit nervous when we arrive at the home of someone we have just met. We don't know how well we will get along when we have been together for a while. 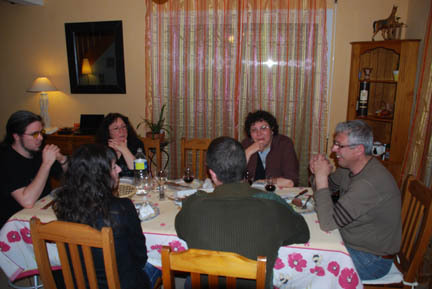 We found out that Christiane and Thierry are a wonderful couple and we thoroughly enjoyed spending 3 days with them. They put us in a spare bedroom, fed us and suggested places to see, until Saturday when they led us to a very interesting Cite de la Mer in Cherbourg. Our first stop while there was to Bayeux. In this town is the Bayeux Tapestry (technically it is an embroidery but it is called the Bayeux Tapestry). It is a 70 meter long (230 feet) by 1/2 meter high (20 inches) embroidery done in the 11th century showing the events leading to and the battle between Harold of England and William the Conqueror of France at Hastings England in 1066. This is a history lesson for the people of that time done as a continuous series of stitched pictures. The fact that it has survived at all is amazing, that it is still vibrant and telling it's tale is beyond description. The colors of the wool yarn are still bright, the detail shows expressions on the faces of the various players in the drama. The arrows fly, the horses charge and the blood flows, Harold dies and William is King of England despite Harold's betrayal. The lesson is taught to future generations of the betrayal of Harold and of his death. No pictures were allowed of it, it is in a dimly lit climate controlled case and protected by guards. You'll have to settle for a picture of a portion that was on a postcard, which doesn't begin to show how amazing it is. 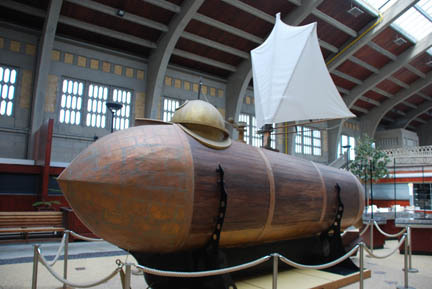 On Saturday we went with Christiane and Thierry to Cherbourg and toured a very well done display on marine exploration at the Cite de la Mer. There was a nuclear submarine to tour and many many displays of man's attempts to understand and use the underwater world. 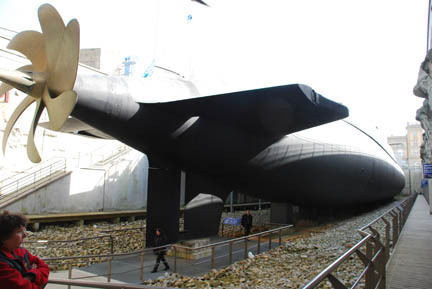 a decommissioned French nuclear submarine. Kathy is on the left, Christiane in the center and Thierry is forward of the rudder. On the way back we separated and we went to the beaches of the D-Day Invasion. All over Normandy and Nord France we have seen American, Canadian and British flags flying at the entrance to a town or in front of a business. 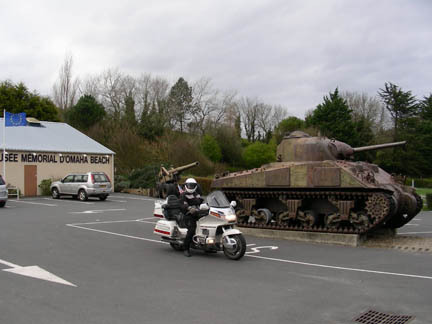 They still remember and appreciate the response to the German occupation. 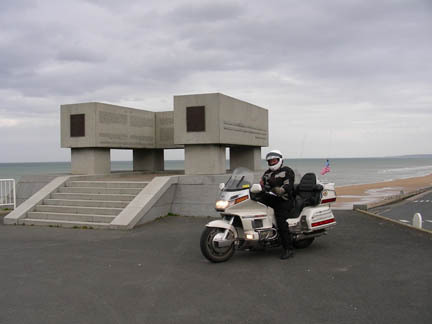 There are many memorials along the famous beaches of the invasion on June 6, 1944. As well as private and public museums dedicated to this pivotal time in the history of Europe that entered through Normandy. 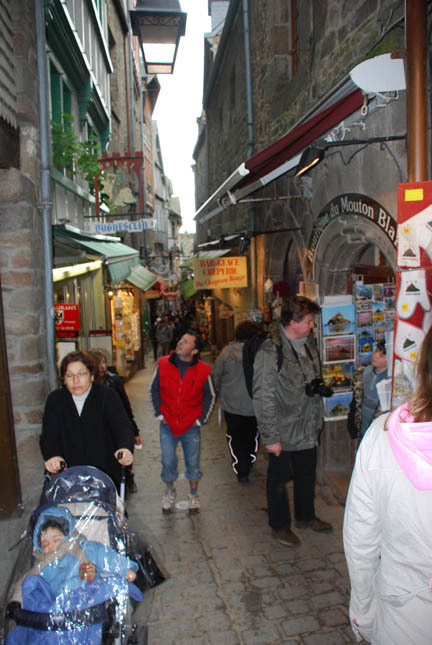 Our last stop before heading directly south was at the very interesting Le Mont St. Michel. This abbey was started in the 7th century and has been remodeled constantly since. It has also been fought over several times since then. It is on a granite pinnacle rising from the tidewaters of a bay, connected to the mainland by a causeway. But getting there was interesting. 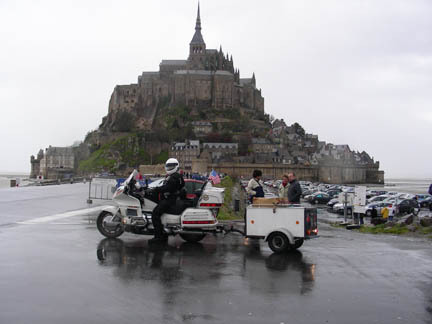 I used my GPS to find the route to Mont St Michel and it said it was 112 km away, which is about what I had estimated. So we followed its guidance until I realized we were going northeast, the opposite direction from our destination!! So I did some exploring of the GPS and discovered I wanted "Le" Mont St Michel. 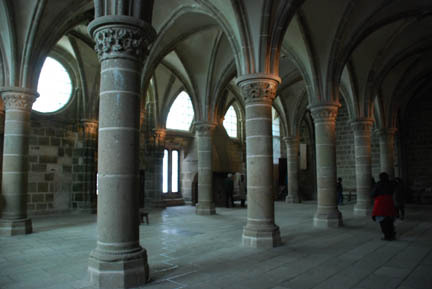 We were on the Peage (tollroad) and had to exit (which cost 90 Euro cents) make an immediate U-turn around the toll booth and reenter in the opposite direction (which cost another 90 Euro cents) and head back to the city of Caen and on to "Le" Mont St Michel. The old abbey is huge and the town that clings to its sides is totally overrun with very tacky tourist stores. This is the main "street" leading up to the entrance of the abbey that was followed by the many pilgrims who have come here over the centuries. I'll bet there were merchants here selling "Holy Relics" to them too. Once you have run the gauntlet of the shops the abbey has an interesting tour of many of its rooms, corridors and cloister. That's enough wars for anyone, tomorrow we visit the ancient town of St. Malo in Brittany, France; then its on to Portugal to visit more friends enroute to the Feria de Abril in Seville, Spain.